Cylindrical, stylish, and it saves you money on your water bill. If some catastrophe suddenly cut-off the entire water supply to San Diego County it wouldn’t affect Cielo Foth. She’d still probably be watering her fruit trees. Cielo’s secret is a home irrigation system that catches the rain falling on her roof and channels it into several 4-1/2 x 7 ft tanks. Currently those tanks are filled to the brim (thanks to our quick rainy season) so Cielo had to buy a few extra barrels to catch the surplus. 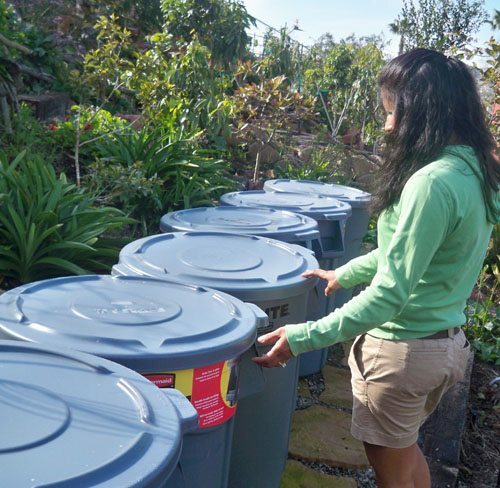 Now, here’s a woman who is doing what we all should: taking advantage of an unlimited natural resource in order to promote a more self-sustaining lifestyle. The decision came naturally to Ceilo. She’s got a degree in civil engineering and her husband’s expertise is industrial engineering. Together, they transformed their hillside backyard into a terraced Eden – a labor of love they embarked upon ten years ago. In 2008, they started attending water allocation workshops where they learned about rainwater harvesting, among other things. 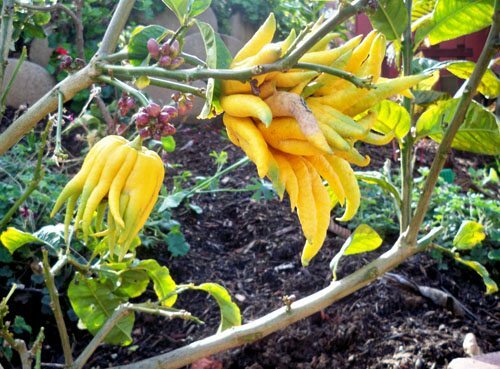 A Buddha's Hand in Cielo's garden. You don't see one of these everyday. Cielo taught me some of the deadly sins of watering. They range from watering on the wrong days to re-filling swimming pools that are seldom used. Oh, and beware of this double-whammy: forgetting to turn off the sprinklers during a rain shower. Doh! Not to worry, folks, we can redeem ourselves. Ceilo’s tips include: Collecting the water that runs while you wait for the shower to warm up. Saving the clean rise cycle from your washing machine. And irrigating with your grey line water. That’s water you’ve already paid for! 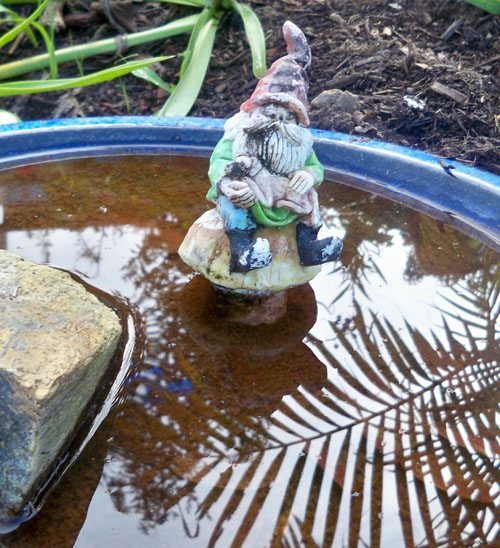 This Gnome negotiates with no middlemen for his H20. He gets it straight from nature. “Last month, we calculated a 72.5% savings in total water usage,” Cielo proudly reports. And thanks Nate for following up on her story – great photos too! Nice job Cielo. Teach, sister, teach! what an awesome idea..advice anyone can use! 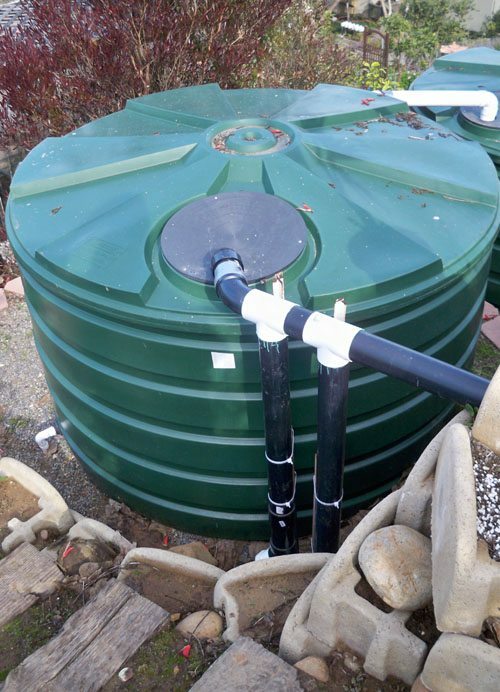 Here is an additional idea that is well worth investigating; taking rainwater harvesting to a new level. The Airigator collects water from thin air, rain or shine. Thanks Nate for providing this follow up story. Great pics too. The Buddah hands are awesome! Way to go Cielo! Thanks for reading the article! Cielo is a great spokeswoman. Very knowledgeable and enthusiastic about her rainwater harvesting. I hope the idea catches on. i am so jealous of what they have going on there. i’ve used wash water in the past for the yard and always felt that we could do more. i wish i had the resources to build a storage system. with the water i drained off my roof this last storm i could have watered the flowers through most of the summer.